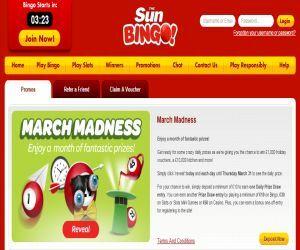 Sun Bingo's March Madness | Win Daily Prizes! March into Spring with Sun Bingo‘s March Madness, and you'll be in for a whirlwind of treats! There's a frenzy of prizes waiting for you to scoop up every day this month until March 31st with Sun Bingo! From holiday vouchers to Royal Ascot Getaways and shopping treats, you better catch them while you can! Every day throughout March, you'll have the chance to uncover a different prize! It's like your opening your Christmas advent calendar early, but even better as it will be sunny! To get caught up in the winning frenzy, all you have to do is top up your account with £10 to play your fave games, and you can collect your ticket to the Daily Prize Draw! If you register at the site for the first time, you can also pick up an extra cool ticket to the Prize Draw! If you add another £10 to play Bingo, £30 for Slots or Slots Mini Games or £50 on the Casino table, then you can get even more tickets! Then you can simply click ‘reveal' every day until Thursday March 31st to uncover your daily prize! There are a whirlwind of prizes waiting to be uncovered! From 140 prize of the day vouchers to 50 shopping vouchers, 15 luxury holiday vouchers, 6 lucky holidays to Ireland, 6 prizes to see the races at Royal Ascot and 150 Daily Draws £50 cash prizes! Looking for more sites to get your bingo fix? You can check out all the latest new sites for 2016 here!